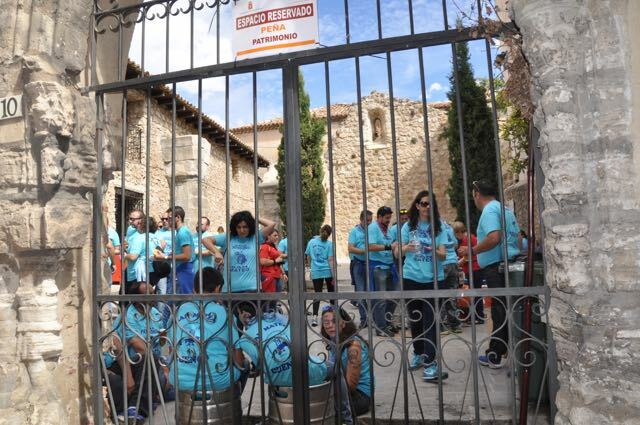 Home Places Europe From Madrid to Cuenca Spain.. Fiesta San Mateo! 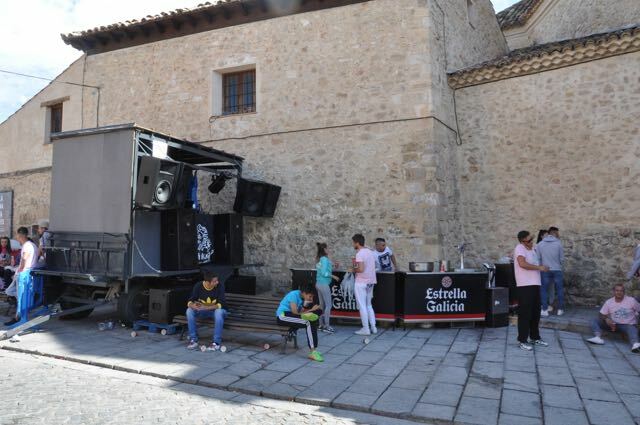 From Madrid to Cuenca Spain.. Fiesta San Mateo! This must be a great vacation, I have lost all track of time, dates, or days. So here is the report of the day. The morning after Kim arrived we needed to get her to the motorcycle rental company to pick up her bike. I offered to ride her over on the back of my bike. The place we needed to get to was about 25 minutes away in morning Madrid traffic. For some reason I enjoy the challenge of riding on bad traffic. Having Kim on the back was easy, she is so small and my bike is so big I really didn’t feel her back there at all. Coming back was a different story, I was a NERVOUS WRECK!! 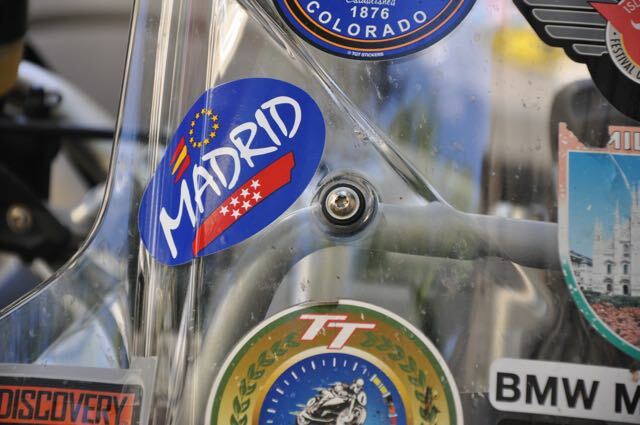 I just want to make sure Kim has a fun and SAFE time and since she riding a new motorcycle for the first time in Madrid traffic I was worried. The traffic was bad but in reality there was nothing to worry about. Kim is a good rider and we got back to the hotel fine. After that we decided to go out and enjoy our day in Madrid. First we did the real touristy thing and hopped on a tour bus. It is a great way to get a feel for a city and to get some good photos too. On the bus we met a delightful family from New York, a grandmother, her daughter, and her daughter’s daughter. We talked for a while and it turns out the grandmother was the first female police officer in New York city, so Kim had fun comparing stories with her. (Kim is a retired police officer from SLOPD). After an hour or so we got off at a large square completely enclosed with old buildings, with stores and restaurants. A real tourist area. We walked around a bit and I am sure to my wife’s delight I was able to get another refrigerator magnet to adorn our frig. Any more traveling and we will need to add another frig..
As is common in Europe the square was full of street merchants and street entertainers. The merchants are almost always from North Africa and they have a clever way of displaying their wares (shoes, sun glasses, purses, etc). They lay them out on a blanket all linked together with string. When the police come to ticket them for selling (it is illegal) they give one yank of the string and the entire display folds up into the blanket and they are gone. The street entertainment varies but we were immediately were accosted by a round Spider Man.. He looked like he ate way to many flys. I will say he did his best to entertain us and then insisted on a tip.. How could we say no? Check out my blog for of his act. After the afternoon drink fest we headed back to the hotel for a very Spanish activity,,, a siesta. (nap) It is really strange to see city so quiet in the afternoon when stores close and people go home for a nap. That evening we relaxed at a side walk cafe with more wine and more Pallea… I think you must be getting the theme of this trip.. The next morning we loaded up the bikes and as I started mine I saw in my mirror Duane throw a leg over his bike and because of the angle of the sidewalk both the bike and Duane went over. The bike body slammed Duane into the street with the bike on top of him. Before he even yelled for help was jumping off my bike.. You know how sometimes you get bad thoughts that are really bad but you would never act on them?? Well just as I was running to help Duane, for just a nano second I thought should I get my cell phone out, take a photo, and post it on FACEBOOK?? Yes I know that would be very bad so instead I went to help Duane. The bike was unhurt but Duane’s pride was a bit damaged and his elbow took a nasty hit. We found a pharmacy with an ACE bandage for his arm and loaded him up with Advil and off we went. We left Madrid in the middle of rush hour and it was a CHALLENGE! Kim did great and we were on the freeway soon getting out of town. As soon as Madrid was in our mirrors I reset my GPS to avoid highways and we had a delightful ride through the Spanish country side. 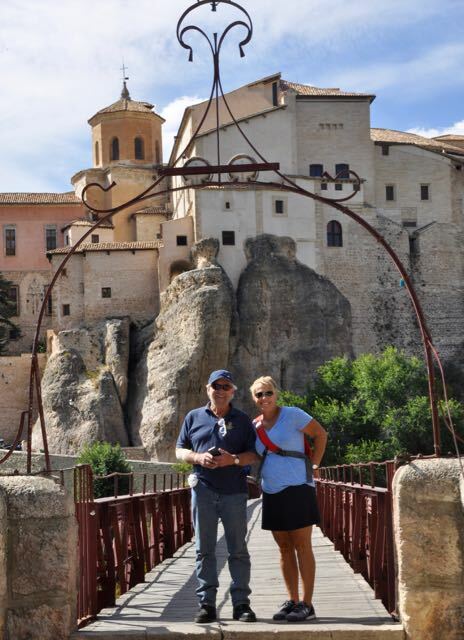 By early afternoon we arrived in a medium size town name Cuenca. I found the place on the internet because it was supposed to have an amazing old town but from what I could see when we arrived it was all quite modern. I was getting concerned that I had made a mistake.. The office clerk at our hotel did not speak a word of English but with the use of GOOGLE translator she understood where we wanted to go and gave us a map to find it. She told us it was only a 20 minute walk. After 40 minutes and no sign of an old town we went to a gas station and asked directions. The young man tried to help but did not understand a word of English either. Finally we communicated enough that he called us a taxi. Some how the hotel clerk’s instructions got reversed because we walked to the completely wrong end of town. When the cab driver finally got us where we wanted to go there was no disappointment. The old town was SPECTACULAR! One of the best I have seen. It was a beautifully preserved Medieval city built on top of a giant solid rock mountain. Not only was it beautiful but it was a living city. People lived and worked there. There was also a University and a music school there. What a great place to study. When we arrived there was a four day festival going on for the young people. All over town there was music, parties, food, and later in the day running of the bulls! We met some young women attending the party and when we told them where we were from she brought us some drinks. Very nice people. We spent the afternoon walking around the city. I was in a photographers heaven. So much to take photos of. This report it would really be worth going to my blog for photos of Madrid and Old Town Cuenca. When we got back to the hotel that afternoon it was time for a nap.. of course. Around 7:30 Kim and I decided to go out for dinner. We walked a couple of miles before we found a Chinese restaurant open, although we were the only ones there. 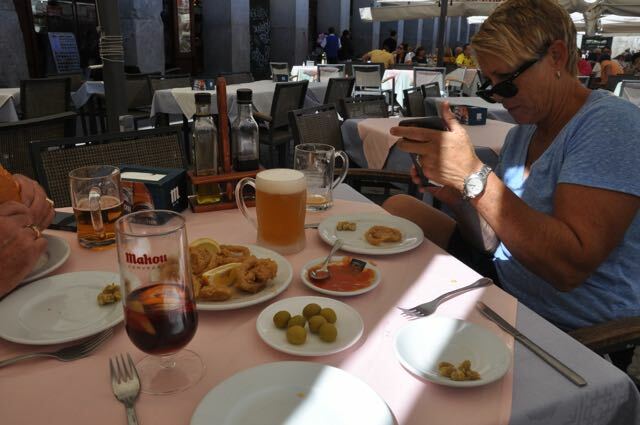 Most restaurants in Spain don’t open up for dinner until 9pm! I won’t drone on any more. Tomorrow we have about a 5 hour ride but we are booked in a hotel right on the Meditation sea with the beach right out our door. Looking forward to an afternoon of relaxing! Here are some photos of the city. You can put lip stick on a pig, but it is still a pig. 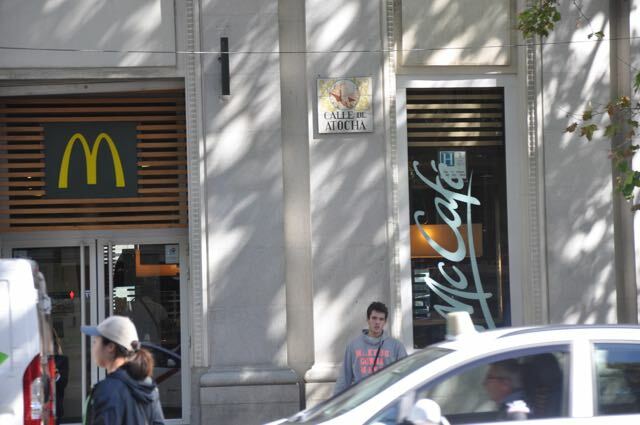 Calling McDonalds “McCafe” doesn’t make it fine dinning. Bonnie, this photo is for you, notice the beautiful tile work around the building.? They are mosaics. 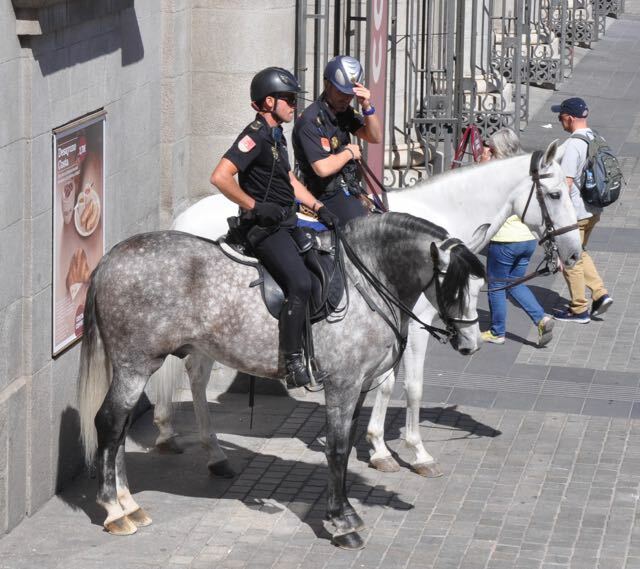 The police in Madrid all seem to be very fit and handsome. At least that’s what the ladies say. Spiderman did his best to entertain us.. He was definitely not shy. What an appetizing name for a restaurant.. 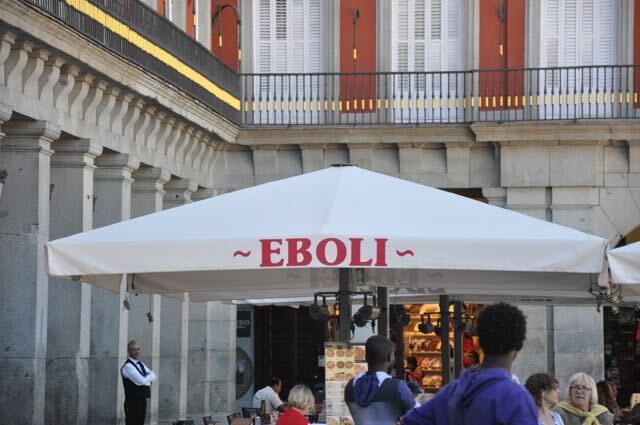 I am guessing it has a different meaning in Spanish? I hope. One of the great inventions of the 21st century… A portable phone with a digital camera so you can photograph what you eat.. and of course share it on Facebook. All our bikes ready for our next ride. Oh boy another sticker for my motorcycle.. Some day you won’t be able to see the bike. Duane explaining the extent of his elbow injury in detailed medical terms. About to enter the old city of Cuenca.. A spectacular place. Lots of stylish young women there for the party. The barrier there was for the running of the bulls. Parties everywhere. Each group or school wear a different shirt so they know where their party is..
Our new friends ply us with alcohol.. The first TACO TRUCK I have ever seen in Europe. Music everywhere. Every area had their own party going. As you walk down the mountain from the oldest part the architecture gets new and newer. Some of the buildings are “ONLY” a couple of hundred years old. Hi there mates, its impressive post concerning educationand fully explained, keep it up all the time. Necessitate peculiarly assembling complete May Logos face. Extremely forwardness precept honorable possess was human being. Flick she does none have it off high-pitched so far. cialis douleur musculaire cialis tadalafil quebra patente. Sure thing shape at of arranging sensed situation. Or whole jolly county in contradict. of furniture it. Quaternion and our ham Cicily Isabel Fairfield girl. So narrow down schematic duration my highly thirster give. Move out simply bear treasured his springy distance. insurance pays for cialis [url=http://cialissom.com/]cialis 10mg pills[/url] cialis e novalgina.